The setting: 1932, Razorhurst. Two competing mob bosses - Gloriana Nelson and Mr Davidson - have reached a fragile peace. Kelpie knows the dangers of the Sydney streets. Ghosts have kept her alive, steering her to food and safety, but they are also her torment. Dymphna is Gloriana Nelson's 'best girl'. She knows the highs and lows of life, but she doesn't know what this day has in store for her. When Dymphna meets Kelpie over the corpse of Jimmy Palmer, Dymphna's latest boyfriend, she pronounces herself Kelpie's new protector. But Dymphna's life is in danger too and she needs an ally. And while Jimmy's ghost wants to help, the dead cannot protect the living. Gloriana Nelson's kingdom is crumbling and Mr Davidson is determined to have all of Razorhurst - including Dymphna. As loyalties shift and betrayal threatens at every turn, Dymphna and Kelpie are determined to survive what is becoming a day with a high body count. Books are magical little things, aren’t they? They can transport you overseas, across galaxies, into fantasy worlds—and in Razorhurst’s case—back in time. Opening the cover of Razorhurst was like stepping into a time machine, travelling back to Sydney in 1932, where a bloody, ruthless mob war raged in Surry Hills. Razorhurst alternates between Kelpie’s and Dymphna’s point of view and whilst they come from different backgrounds, they are connected by their ability to see the dead. With the back alleys and narrow laneways of Razorhurst often running red, it’s a curse rather than a gift. The supernatural elements add a layer of dark mysticism to the novel; I especially enjoyed the description of the ghosts, both the talkers and the silent, and the scene at Central Station was especially chilling. Whilst the setting and era of Razorhurst could be compared to the Australian TV Show, Underbelly: Razor, it is more a personal story of survival than a tale of mob bosses struggling for supremacy. Dymphna wants to change her future, setting her sights on being the next ruler of Razorhurst, and Kelpie wants to escape the constant grey noise of the dead. Through their forced meeting, over the corpse of Dymphna’s latest boyfriend, their future is rewritten—but not before a lot of blood is spilled. 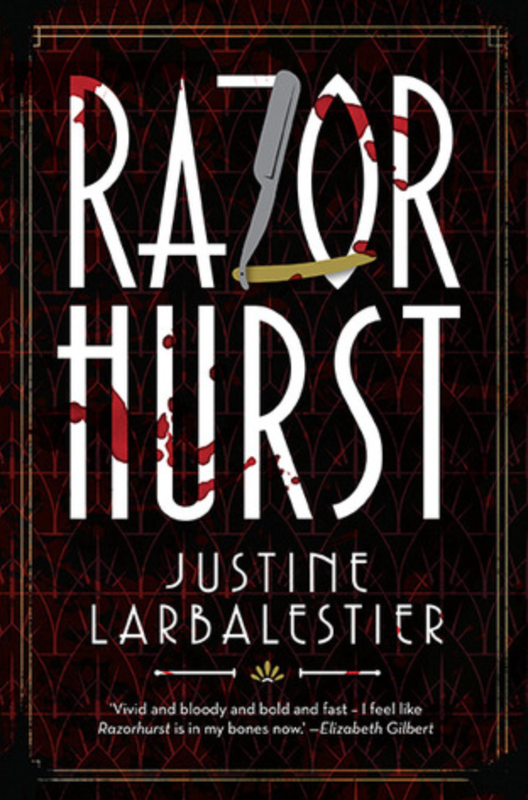 Razorhurst, like a razor, is sharp and cutthroat—the result bloody and often painful. It’s a bold Young Adult novel that doesn’t shy away from the gruesome and dirty underbelly of the era and treats its young readers with intelligence and respect. Larbalestier does a stellar job of ensuring the book doesn’t stray too far into the macabre and shrouds Dymphna’s provocative profession in ambiguity, keeping the rating as PG as possible. Reading Razorhurst is like watching 24, with the storyline transpiring over one day. This short timeframe sets the pace and tension as we follow Kelpie and Dymphna’s plight, in what feels like real time. The only relief from the mob bosses’ relentless pursuit of Dymphna and Kelpie is the additional backstories on the characters in every second chapter. This detail fleshes out the period and further submerges you into the dark and gritty world of Razorhurst. I’ve not read such a fully immersive story-world for some time. One downside to having the novel only take place over one day is that the budding romance between writer Neal Darcy and Dymphna could have been further developed, but time constraints would have made these developments feel forced. It’s a shame—as I wanted to care more for Neal, like I did for Dymphna and the particularly empathetic and likeable Kelpie. Having lived in Sydney for almost ten years, I thoroughly enjoyed reading about Surry Hills, Darlinghurst, Potts Point, Central Station and Kings Cross as they would have been back in the 30s. It’s clear that Larbalestier has meticulously researched the era: the characters, language, settings and culture are authentic and enthralling. And whilst I don’t read a lot of historical fiction, I enjoyed my nightly time-travel expeditions to the 1930s and would happily return for another outing to the corrupt underworld of Razorhurst. I give Razorhurst 4.5 out of 5 stars. * Many thanks to Allen & Unwin for providing the advanced reader copy. How to carve the perfect pumpkin, Disney-style!